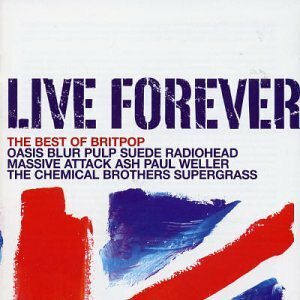 'Live Forever' (the film) is a brilliant & hilarious insight into 90s Brit-pop. Across the globe, music, art, fashion & film became cool if it was British. Home-grown talent from the likes of Liam Gallagher, Damon Albarn & Jarvis Cocker flourished. 'Live Forever' charts the sounds that defined these times. The film is a docu-film that gives outrageous banter from the Gallagher brothers, 3D from Massive Attack, Jarvis, Damon, footage from Rolling Stones at Spike Island & takes us up to the manufactured bands of today. 39 tracks. Virgin. 2003.